For many people the land of Kashmir conjures up mystery and intrigue. The economy is essentially agriculture, for example the famous Cashmere wool, but Euro Games Technology have added gold to the mix and presented a 5 reel 20 pay line slot game with potential for good rewards including the Kashmir Golden Jackpot worth 100,000 credits! The icons on the reels are varied, from the animals typically found in the region such as the Tiger and the Peacock to ancient objects like a very old book as well as Ganesha, a God with an elephant head. The game has Wilds and Scatters, Free spins and Multipliers. Some generous Free Spins are available – trigger at least three Scatters of the Taj Mahal icon 0n a single spin and you are rewarded with 15 Free Spins. Winning on a Free Spin will earn x3 multiplier. However there is more to be won – you can get a total bet multiplier by again spinning 3 Taj Mahal icons will reward your total bet x5, spin 4 increases your multiplier x25 and if you are really hot and trigger 5 of the Taj Mahal icon you earn a mind blowing x250 multiplier of your total bet. With a double or nothing option you can take this decision to double your winnings by guessing the colour of a turned over card. 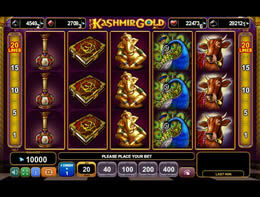 Kashmir Gold is not a complicated game and has ample opportunities to earn good money. It is worth a gamble! !